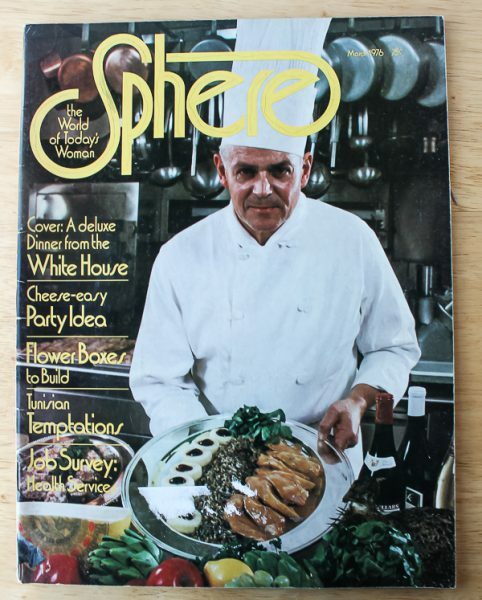 The chef in the photo is Henry Haller, who as this issue was written, was the White House chef to President Gerald Ford. Sphere editors were invited to a state dinner given in the honor of Egypt’s President, Anwar Sadat, and his wife. It was the leading article for the March 1976 issue along with recipes from the White House kitchen. The elegant dinner served at this event included Filet of Sole Veronique, Supreme of Pheasant Smitane, Wild Rice, Eggplant Fermiere, Bibb Lettuce Salad, Bel Paese cheese, Peach Melba, Petits Fours, and Demitasse. Dry Creek Chenin Blanc 1973 and a burgundy Buena Vista 1969 were served with the fish and pheasant courses, Schramsberg Blanc de Noirs 1971 champagne filled the glasses for the toasts. The entertainment that evening consisted of Pearl Bailey singing “Hello, Dolly!” Guests were excited to dine with invited personalities Omar Sharif, Henry Kissinger, and Happy Rockefeller, to name a few. The dinner didn’t end until 2:00 a.m.! Now that’s a party! If you have the desire to have an elegant gala yourself, all of the recipes for the dinner are in this issue. Moving on, the next article is all about raclette, the Swiss way with cheese, followed by a Tunisian feast for eight, and lastly, a Graduation Day party for forty-eight guests! There were so many recipes to choose from in this issue, but since this is St. Patrick’s Day weekend, I selected a simple and tasty corned beef sandwich from the graduation party article. 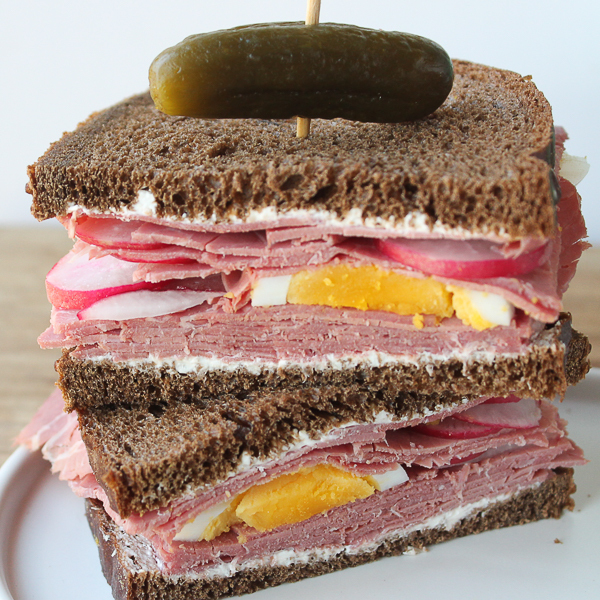 I have never seen a recipe for a corned beef sandwich like this one, that included sliced hard-boiled eggs and slices of radish. There is also a delicious spread of cream cheese and horseradish. It was really good! Since all the recipes in the graduation party served forty-eight, I had to drastically cut down on the ingredients to make just one sandwich, but since the amounts were very specific, it was easy to figure out one sandwich. Colorful and different, don’t you think? 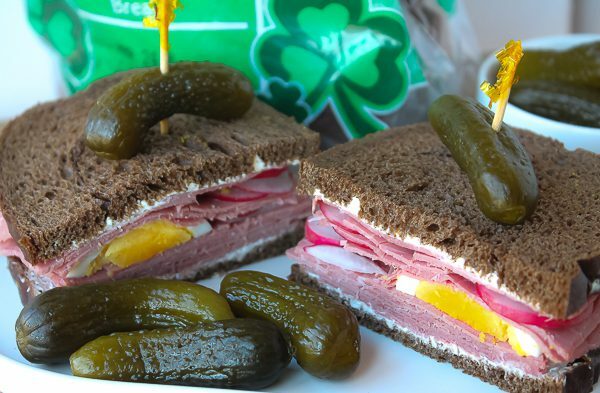 I happen to love hard-boiled eggs, radishes, pumpernickel bread, and horseradish, I thought it was a great way to use sliced leftover corned beef from a St. Patrick’s Day meal, or if it’s not made this weekend, deli corned beef can be used instead. Have a fun and safe St. Paddy’s Day weekend! Don’t forget to save some of the corned beef for this sandwich. Have the White House Dinner another time. ½ to 1 teaspoon prepared horseradish, depending on how much you like horseradish! Lay the bread out side-by-side on a cutting board. Mix together the cream cheese and horseradish in a small bowl, and spread evenly on bread slices. Cover one slice of the bread with half the corned beef slices. Top with the sliced egg and radishes, then the rest of the corned beef slices. Top with other slice of bread. Cut carefully in half and serve. Serves one.